An arch may be defined as mechanical arrangement of wedge shaped blocks of stones or block mutually supporting each other and supported at the end by piers or abutments. 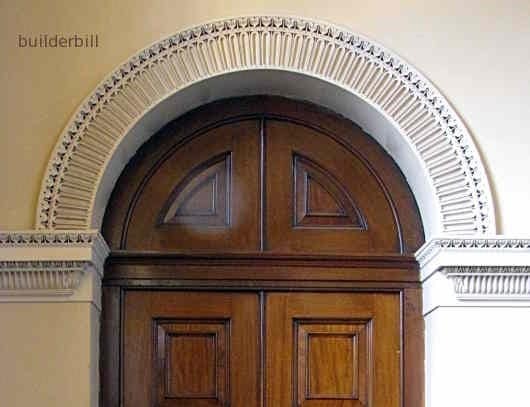 In common with lintels, the function of an arch is to carry the weight of the structure above the opening. Because of their shape, the blocks support each other by the mutual process by the resistance from the support. When used over opening of door or window, the flat arch acts similar to a lintel. Flat arch, also known as straight or camber arch, is laid with its bed joints radiating to center. The skew back is made to rest in an inclined position so as to make an angle of 60 degree with the springing line. The extrados of the arch is horizontal but the intrados has a straight camber or upward curvature. The camber is usually 2 mm. for every 30 cm., of span and is necessary to avoid optical illusion of sagging. Flat arches are not strong as compared with other forms. The arch derives its name from the shape of the curve given to the arch soffit. 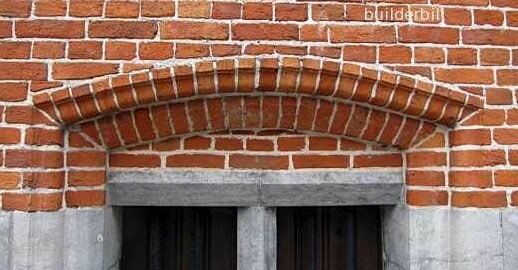 The different types of semi-circular arches in stone and brick masonry. This type of arch is segmental in shape and is commonly provided for openings of various sizes. The bed joints of segmental arch radiate from of common point, which lies below the springing line and is equidistant from all points on the arch curve. 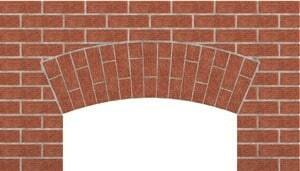 When used over a lintel, segmental arch is termed as “relieving arch”. 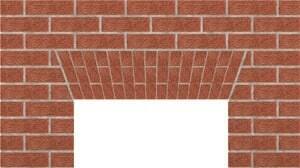 Where a wooden lintel is required to span over wider opening, brick relieving arch is usually constructed above the lintel. The arch thus constructed relieves the lintel of the load from the masonry above and hence the size of the lintel can be appreciably reduced. The relieving arch should have its abutments clear of the ends of the lintel so that the skew back slopes outward and away from the top edges of lintel ends. Thus the span of a relieving arch will be equal to the clear span of the openings plus twice the bearing of the existing wooden lintel. The advantages of this type of construction is that the wooden lintel when decayed can be replaced without affecting the stability of the structure. This type of arch is similar to a flat arch in design but differ in shape and method of construction. This form of arch is not so sound and as such it is only suitable to be provided for small openings.